It looks like yesterday Eurodollar completed its correction and Take Profit on my buy order worked. Later I opened sell order and expect price to break local minimum. Target is close to lower fibo-levels at 1.3550. 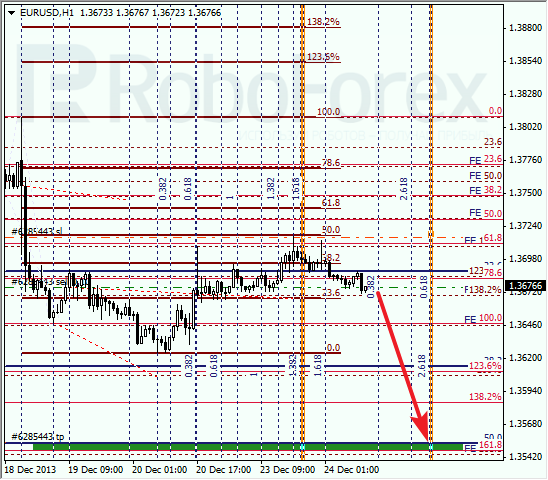 As we can see at H1 chart, on Monday price rebounded from local level of 50% inside one of temporary fibo-zones. Most likely, lower levels will be reached during this week. Franc may have already completed its correction. Target for bulls is close to upper fibo-levels at 0.9030. I’ve got only one buy order so far. Yesterday market was just several pips shy to reach level of 50%. Most likely, later pair will start moving towards previous maximum and break it. According to analysis of temporary fibo-zones, upper levels may be reached during the next several days.